A new mid-season raspberry bred by the Scottish Crop Research Institute, Glen Ample is a truly remarkable variety we are proud to introduce. 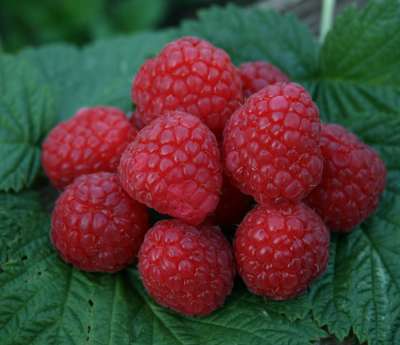 In trials Glen Ample has ALWAYS outyield ALL other other varieties to give quite amazing quantities of impressive large fleshy fruits blessed with a lovely sweet flavour. This was no doubt inherited from its parent, Glen Prosen. It has a very long picking season, in fact it is not usual to be harvesting fruit from this variety for more than a month. The smooth spine free canes make picking easy and are quite upright, making this the variety to grow if space is at a premium. It has shown resistance to two types of Aphid Virus Vector. With its impressive yield, very large fruit, spine free growth and lovely flavour Glen Ample is going to be very, very popular. Early ordering advisable to avoid disappointment. NOTE; Glen Ample is not recommended for the coldest northern areas, and will perform, best with good soil conditions.